I am on a few wood-related mailing lists that send out their weekly e-letters. I am continually amazed at the less than stellar information that is propogated. And the latest one is from a major magazine. It spurred my interest again about a particular aspect of pen making that just keeps being propogated as fact. Where in fact, it is really in error. 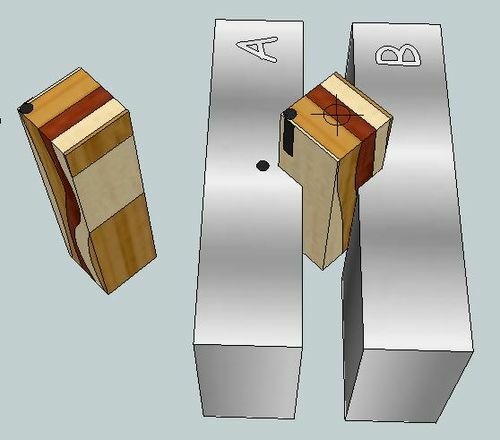 It has to do with aligning the holes between two halves of a pen blank. Like you would do with a Cigar pen. 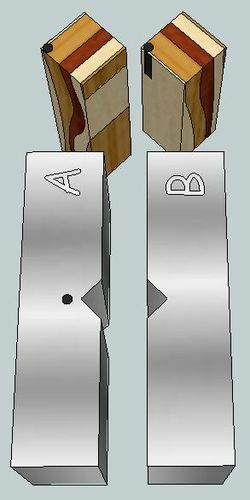 We’ve been told though, that if we align the dot on the second blank with that same dot on our vise, then the offset will be cancelled out. This would be fine if it actually worked. Actually, it WILL work if the error is in the direction of the other jaw. The problem comes when the bit wanders in ANY other direction, such as shown in the previous picture. 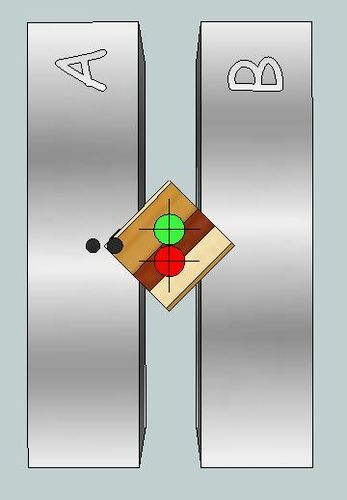 In the Green location, it would correctly align the grain of the two blanks. Conclusion: Mark your pen blanks but don’t bother with the ‘Dot Theory’. Just do a better job of setting up your drill press. Or just use your lathe for the drilling. Hope this helps someone out. And I hope I havn’t stepped on any toes out there. I don’t turn pens, but your explanation makes sense. 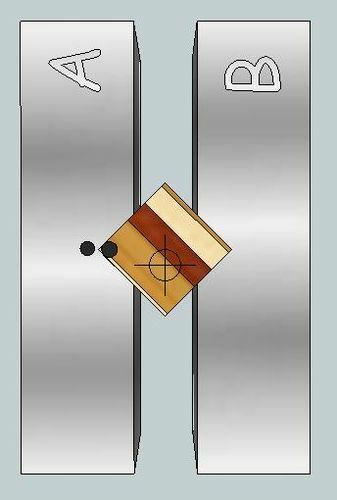 I really appreciate the time you spent in sketchup. I use it all the time to try out my hair brained ideas before I waste shop time and money. If I ever get into pen making I will have to keep it in mind. I am new to turning pens. I am really enjoying it though. This is the first I’ve heard of the dot theory, and am somewhat baffled by it. I carefully set each blank up in the drill press to start drilling on the end where I cut the blank. Then, I carefully set things up to drill as perfectly on center as I can get. I mark this using a center finder and then locate point of my bit to it. Here’s my problem. The bit, depending on grain direction, and a variety of other things, sometimes wanders a tiny bit anyway. That’s why we trim the ends isn’t it? To make sure the ends are square with the tube? 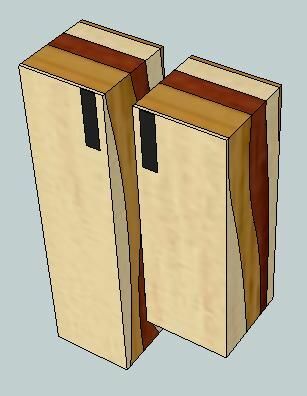 Anyway, if I do everything right as I described, I haven’t had any issue yet with lining the grain back up beautifully after turning the blanks. I just fail to see how this dot theory could make things any more accurate, at least as far as I think the human eye could see. If there is a point to it besides an exercise in frustration, I hope someone would enlighten me. Your explanation makes sense from when I worked in a machine shop. However, your last comment makes the most sense, do a better job lining up your parts when drilling. I agree with Monte on this, set up is the key and attention to detail is important. But…..if the grain does not match up the way you want it save both blanks, make two more from a different wood and mix and match. Crazy I know but I sell more of those pens than the matching one’s. I glue up all the acrylic cut off’s and make a pen from them and it usually gets sold first. William, If your bit wanders(sometimes mine do too), no amount of squaring the ends will fix that. What you want to do is compensate when drilling your 2nd blank to make it match the first. Squaring the ends with your pen mill only makes them smooth, flat, and perpendicular to the tube. It makes sure the mating brass hardware fits flush all the way around the pen. Norman, Using a centering vise gives you consistency from one blank to the next. If the vise is aligned perfectly, then no use for the witness marks in the first place. If the vise is not perfectly aligned, then no amount of witness marks etc. will compensate for the error. Fwiw, using witness lines when mounting a blank in the vise is the same as the ‘Dot Theory’. Hope this helps. Woodbutcherbynight, You are right. When I blow out a blank and have to fix it, I then have to sell it for more because it took more time, AND it usually looks better. So funny. Per your suggestion, I think I’m gonna stop turning plain pens and have ALL mine customized. Thanks for your input. I’ve never had my bit wander enough yet to justify all this. I will keep this thread in mind to refer back to in a case it happens to me on some kind of material that I can stand the thought of wasting. I don’t make pens, but I think the centering is very important. I always use a center drill to start a hole in wood because a twist drill will “walk” when it hits the grain. One thing I think I would do is to first drill the part through past the cut line a bit. Then cut it it half and continue drilling in the partial hole through the second half to the other end. That way the hole is exactly aligned with the first half. You could mark the cut line so you have those two ends come together on the actual pen so the grain pattern is continuous.